Unexpected problems with a NASA science satellite in orbit around Mars could delay receipt of telemetry from the agency's $2.5 billion Mars Science Laboratory rover during the spacecraft's dramatic seven-minute descent to the surface Aug. 6, officials said Monday. While the issue with the orbiting Odyssey satellite will have no impact on the rover's ability to successfully execute its autonomous entry, descent and landing sequence -- half jokingly dubbed "seven minutes of terror" by project engineers -- it could mean an additional period of nail biting before confirmation the so-called "sky crane" landing technique actually worked. Touchdown on the floor of Gale Crater is expected at 1:17 a.m. EDT (GMT-4) on Aug. 6. Because of the distance between Earth and Mars on landing day -- 154 million miles -- the earliest possible confirmation of landing would come 13.8 minutes later, at 1:31 a.m. "Earth-received time." "Odyssey lost a reaction wheel a few weeks ago," Doug McCuistion, director of the Mars Exploration Program at NASA headquarters, told reporters. "That was totally unexpected. Reaction wheels are utilized to help manage spacecraft attitude and momentum in space. We haven't fully worked out the issue related to that loss yet, but we have plenty of backup systems." To be clear, he said, "it won't have any impact on (the rover's) landing. It's all a communications issue." The Mars Science Laboratory rover, named Curiosity, is one of the most expensive -- and technologically challenging -- planetary science missions ever attempted. Over the course of a two-year mission, the nuclear-powered rover will explore Gale Crater and attempt to climb up a 3-mile-high central mountain, using a suite of sophisticated instruments to help scientists understand the broad history of Mars and whether it ever hosted a habitable environment. 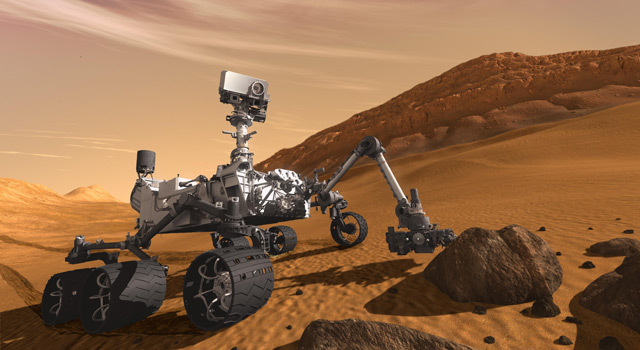 Tipping the scales at one ton, Curiosity is the size of a small car, too large to use the airbag landing system devised for NASA's Pathfinder and the long-lived Spirit and Curiosity rovers. Faced with the challenge of getting a large rover off the top of a traditional rocket-powered lander, engineers came up with a novel approach known as the "sky crane." Instead of putting the rover on top of a legged lander, they put the rover below it and did away with the legs altogether. As the lander approaches the surface, descending under the power of eight rocket engines, Curiosity will be lowered on a long cable directly to the ground. Once its wheels make contact, the cable will be severed and the rocket-powered descent stage will fly off to a crash landing a safe distance away. Even engineers familiar with the sky crane system confess to "anxious anticipation with a little bit of nerves," says project manager Pete Theisinger, a condition likely to be amplified by the possible absence of realtime telemetry through landing. At the time of Curiosity's touchdown, Earth will have dropped below the martian horizon and direct line-of-site communications will be cut off a few minutes before landing. The approach to Mars and the descent through the atmosphere were designed so multiple satellites would be above the horizon and able to capture telemetry during all or part of the entry. But only one of them -- Odyssey -- is capable of relaying telemetry from the lander back to Earth as it is received all the way through touchdown. NASA's Mars Reconnaissance Orbiter will record telemetry all the way from atmospheric entry to a few minutes past touchdown, but the satellite must store the data on board and re-transmit them a few hours later. The European Space Agency's Mars Express satellite also will "see" the rover's descent, but not all the way to the surface. If Odyssey is out of position to relay realtime telemetry from Curiosity during the landing phase, the satellite still will fly over the landing zone within a few minutes of touchdown, when transmissions from the lander could be relayed to Earth, confirming a successful touchdown. But depending on Odyssey's orbit and a variety of other factors, engineers may be forced to wait on the Mars Reconnaissance Orbiter to find out whether Curiosity survived the long-awaited descent. "That depends on whether or not Odyssey is moved in its orbit," said Theisinger. "If the program decides to position Odyssey back to its correct position and that is successful, and MSL transmits UHF (telemetry) successfully and Odyssey receives it successfully, then we would expect to hear at 1:31 (a.m.) EDT that we have landed successfully. "If Odyssey is not able to be moved and it still remains late (flying over the landing site), that means that it will fly over the spacecraft after the spacecraft has landed and we presumably will be able to see transmissions from it. That, once again, depends on what the program decides to do and the ability of MSL and Odyssey's telemetry systems to work." Regardless of whether engineers receive confirmation of landing in realtime, within a few minutes or a few hours, they fully expect the system to work. But the mission's price tag and technical complexity have prompted program managers to go out of their way to make sure reporters understand it's far from a sure thing. McCuistion said MSL is the "most challenging mission we've ever sent to another planet and certainly the most challenging we've sent to Mars. It truly is a major step forward, both in technology and in potential science return and science capability to unlock the mysteries of Mars in places that have never been accessible to human kind in the past." The sky crane is "not a crazy concept," he said. "It works. Is it risky? Landing on Mars is always risky. There are hundreds of discrete events that occur, from release of the cruise stage, to parachute deployment, to heat shield deployment. All of these are unique and any one could cause problems. We go from 13,000 mph to zero in seven minutes. That's quite a challenge in itself. And then there's the unknown, there's Mars. Mars throws things at you -- dust storms, atmospheric density changes, wind. So it's a very unique and challenging environment." He described entry, descent and landing as "a game of dominos. With the release of that cruise stage about 10 minutes before we hit the top of the atmosphere, that's the first domino that's been flicked. The long string of dominos that follows, they're supposed to fall in sequential order, all done autonomously. If one of them is out of place it's very likely that the last domino won't fall, which means the Mars Science Lab, Curiosity rover, may hit the ground harder than we want it to." "Remember, every landing is unique, every landing is like a first," he said. "I'm incredibly proud of the team that's done this. They have done a fantastic job. ... They've done everything possible to ensure the success of this mission."